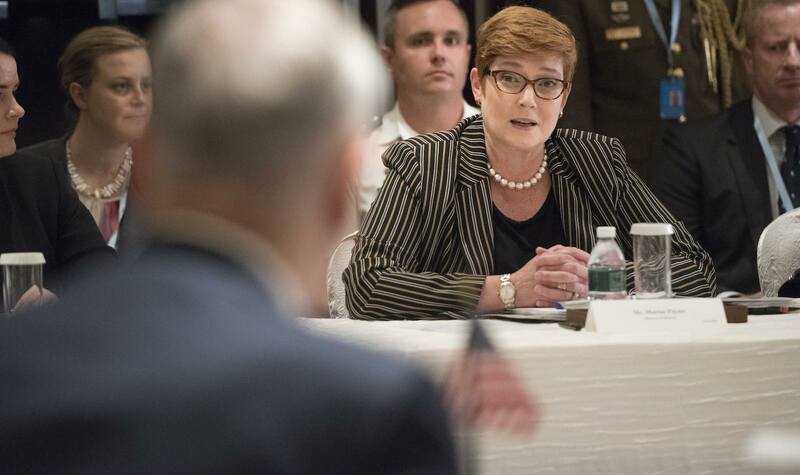 Foreign Minister Marise Payne’s speech comes after a concerted run of major foreign and defence policy speeches, each laden with announcements as the major parties joust in unofficial campaign mode running up to the 2019 federal election. First was the Opposition Leader Bill Shorten’s speech at the Lowy Institute on 29 October. A day later, Shadow Foreign Minister Penny Wong addressed the APEC Study Centre in Melbourne on “Future Asia and the Pacific”. Prime Minister Scott Morrison spoke on 1 November for the Asia Society at Bloomberg’s headquarters in Sydney and again at Lavarack Barracks in Townsville a week later. The speech focused on a broad survey of the security and foreign policy challenges facing Australia today. Minister Payne has the unenviable task of following in the footsteps (if not the “comfortable work boots”, a.k.a. red satin shoes just donated to the Australian Museum of Democracy) of the popular, confident, and competent former foreign minister Julie Bishop. Payne’s speech began with the statement: “the first duty of any government is keeping Australia and Australians safe”, setting the scene for a focus on security. She ended the speech reiterating this. As a former defence minister, a focus on security and defence was to be expected. The Senator handled questions on this area adroitly and with a facility for the numbers and facts. It’s a shame Payne’s government had made all its announcements on foreign and security matters before she spoke today. It left her with no concrete “announceable”. The speech focusing instead on a broad survey of the security and foreign policy challenges facing Australia today. The order she approached them and the detail she devoted to them gave some insight into her or her government’s priorities: cyber (at length), space, weapons of mass destruction, terrorism, the Pacific (at length), and Myanmar (briefly). On China: there were few references in Payne’s speech. She mentioned a “rising, more assertive China”. There was no specific mention of it in the part of her speech dealing with the escalating cyber threat. This was noticeable coming just over a week after the revelations of some fairly audacious Chinese hacking of Australian business communications, and especially when paired with the minister’s explicit condemnation of Russia’s cyber-ops interference with the MH17 investigation. On the US alliance: there were some brief references to the United States and the alliance but without the sort of overt reaffirmation of the alliance’s importance to Australia that featured in Morrison’s Asia Society speech and also in Shorten’s (“the pillar of our foreign policy”). For a speech on security challenges this was puzzling, given Payne's remark last month that the alliance is "as vital as it has ever been". On Indonesia: there was just one reference by Payne, in relation to cooperation on the terrorist threat. The risk of that approach is that it undermines the government’s attempts to move the Australia-Indonesia relationship beyond people-smuggling and the terrorist threat to a broader strategic and economic partnership which both the PM and alternative PM raised in their speeches. On the Pacific: here, they are all in furious agreement about the importance of the Pacific – Payne termed it “one of our highest foreign policy priorities”; it’s “our patch” (the expression used by Morrison); the “blue continent” (Shorten); “our front yard” (Wong). The policies may differ, but the emphasis is clear. On Jerusalem: there was no mention of the now notorious and controversial government proposal to move Australia’s embassy from Tel Aviv to Jerusalem announced during the Wentworth by-election campaign. The Prime Minister addressed the issue at some length in his 1 November speech. Had the Foreign Minister been questioned on it today, she would no doubt have deferred to the result of the current review. On diplomatic infrastructure: the Coalition Government, with Julie Bishop as foreign minister, has made significant investments in Australia’s small diplomatic network, adding 10 new posts since 2013, bringing the total to 117 across the globe. Morrison announced five more posts in the Pacific in his 8 November speech. Wong promised four more posts in Asia on 30 October. While these new posts are a positive development, even when they have all been established and opened Australia will still have the second smallest network of all G20 nations, a network around the same size as that of Belgium (an economy less than half the size of Australia’s), and smaller than those of Hungary, Portugal, South Africa, and Greece. The resourcing of the Minister’s own department has also remained static despite the physical expansion of the network, and our own research at the Lowy Institute has found there are fewer Australian diplomats posted overseas now than there were 30 years ago. In answer to a question on this, Payne referred to the changing nature of work, a government working within its means, and a well-supported department. Fewer people spread across more posts. Somewhere the numbers don’t add up. The New Colombo Plan: this was a signature initiative of Payne’s predecessor and an effective public diplomacy program boosting Australians’ Asia literacy by supporting scholarships for students to study and intern in the region. The Government’s broadcasting review and Foreign Affairs’ review of Australia’s soft power in the region weren’t mentioned in the speech. In answer to a question on them, Payne referred to the government’s plans to work with commercial partners to increase access to Australian content in the Pacific. Wong referred specifically to the cutting of public broadcasting to the Pacific and the need to remedy it. China’s island building in the South China Sea: there was an oblique one-line reference to China’s assertive stance in the region. This stands in stark contrast with the former prime minister’s robust language in 2017 (precipitating a diplomatic freeze with China). It also contrasts with the approach of Shorten and Wong, both of whom described at some length in their speeches how a Labor Government would engage with China.